B2B businesses are conventionally harder to market than those selling to consumers, which especially requires strategic planning and phases of digital marketing tactics across channels. According to Nielsen research, women aged 13-34 like aspirational, off-beat and humorous ads while women between 35 and 54 year old like family themed sentimental ads. Facebook is to launch several premium ads products soon to provide brands more ways to advertise to its audience on Facebook, and changing the current Page design to timeline (by end March). This post briefly discusses the changes on Page and ads marketers should be aware. According to a new Nielsen report on the changing Asian media landscape, Asian countries rank amongst the top globally for media consumption with four of the top five nations for home TV and online video usage located in the region. Asian countries also took all five spots when it comes to mobile video usage, among which Singapore ranked number five in Nielsen’s Mobile Video Usage Index with over 3.5 million mobile video viewers (compared to 3 million TV viewers and 2.5 million Internet video viewers). 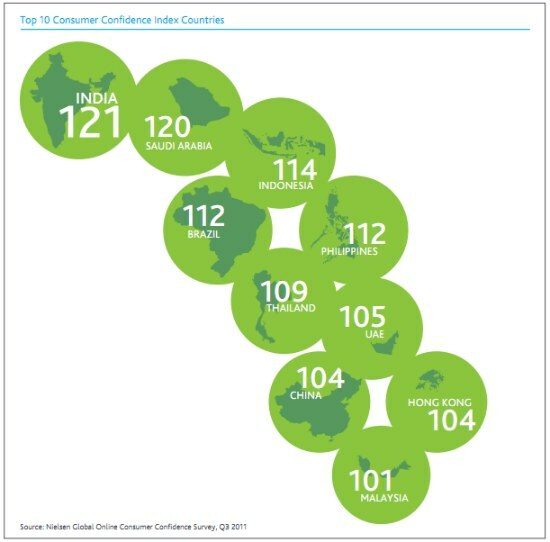 40% of online consumers in Asia Pacific claim to view online product reviews for purchase decisions. Consumers in Vietnam were most likely to turn to online reviews before making a purchase decision at 81 percent, followed by Chinese (77%) and Thais (69%). Although online advertising has a higher average return on investment and digital advertising accounts for 14% of global advertising spend, budget allocation to digital platforms in Asia Pacific is failing to keep up: it accounts for less than one percent of total spend in markets such as Singapore, Malaysia and Thailand. However, it’s also a period of time you can utilize the low-budget allocation on digital in this region as when many companies shift more budget from traditional marketing to digital, it will cost you a lot more. Consumer confidence also fell by nine points last quarter in Singapore to 94, alight above global average 88 according to third quarter global online consumer confidence findings from Nielsen. The 500 fastest-growing private companies are continuing to increase their usage of some social media tools, while pulling back from others according to a study by University of Massachusetts Dartmouth Center for Marketing Research. Facebook, LinkedIn and Twitter are the top three social media tools used by Inc. 500 companies last year though more have had success with bulletin boards, blogging and mobile apps. The percentage of digital consumers aged 15 and above in Singapore who own laptops, tablets and Internet capable mobile phones are 86%, 23% and 85% respectively.